Kia VP Hank Lee says the automaker should easily sell more than 500,000 cars in Europe next year. Kia Motors Corp. has ambitious growth goals for Europe. "In western Europe we will sell about 290,000 units in 2011. 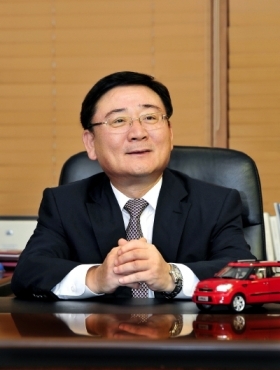 In 2013, we want to sell 450,000 units," said the company's vice president, Hyoung-Keun (Hank) Lee, in an interview with Automotive News Europe. Last year, Kia sold 263,000 units in western Europe. In greater Europe, which includes Russia and the former Soviet republics, Kia aims for sales of 470,000 in 2011, Lee said. "In 2012, we will have the first full year with the Rio and Picanto and half a year with the Cee'd, so it should be no problem at all to sell more than 500,000 units in Europe," he added. When asked if Kia could achieve 1 million annual sales in western Europe in the near term Lee said: "I don't think that this will happen anytime soon. Maybe together with Hyundai in 2014, but not alone. One million is a huge number. Maybe Kia will achieve it in 2020, but it's hard to tell. It depends on the progress and we are being cautious." Kia does not have plans to add a second assembly plant in Europe. Said Lee: "Our priority is to fully utilize existing capacity first, partly also due to the changing market conditions. As of March-April 2012, we will add a third shift to our plant in Zilina, Slovakia, which will bring us up to an annual capacity of more than 300,000. Beyond that, we remain cautious." About 60 percent of the new cars Kia sold in Europe last year were produced locally.